James Sands-Edwards, 43, of Sandbed Lane, Bargate. Indicated a guilty plea to being in the company of a specific person which he was prohibited from doing by a restraining order. Must pay a £115 victim surcharge. Committed to prison for 14 weeks. Paul Webster, 50, of College Street, Long Eaton. Pleaded guilty to damaging a front door valued at £440 at Long Eaton. Fined £120 and must pay £440 compensation, a £30 victim surcharge and £85 costs. Stewart Daniel Boughen, 44, of Byron Street, Ilkeston. Admitted failing to comply with the requirements of a community order by failing to attend with the responsible officer. Order to continue but varied with 15 hours of unpaid work and the original requirements including a Rehabilitation Activity Requirement and unpaid work. Must pay £60 costs. Andrew David Brown, 48, of York Road, Long Eaton. Proved in absence that he failed to comply with the requirements of a community order by failing to be at a curfew address during specified curfew hours. Fined £240 and must pay £60 costs. Kelly-Anne Jones, 48, of Wharfedale Road, Long Eaton. Admitted failing to comply with the requirements of a community order by failing to attend with the responsible officer. Must pay £60 costs. Marie Summers, 47, of Marshall Way, Ilkeston. Indicated a guilty plea to producing four plants of class B drug cannabis, at Ilkeston. Fined £180 and must pay a £30 victim surcharge and £85 costs. Michael Dean Kirkham, 30, of Alder Road, Belper. Pleaded guilty to driving a vehicle on Harrington Street, Derby, when the proportion of a controlled drug, namely Tetrahydrocannabinol, exceeded the specified limit. Fined £155 and must pay a £30 victim surcharge and £300 costs. Disqualified from driving for 20 months. Claire Harris, 41, of Fritchley Court, Mansfield. Pleaded guilty to using a vehicle without insurance on the A610 at Ilkeston. No separate penalty. Disqualified from driving for 12 months. Pleaded guilty to driving a vehicle otherwise than in accordance with a licence on the A610 at Ilkeston. No separate penalty. Pleaded guilty to using a registration mark fraudulently at Ilkeston. Fined £120 and must pay a £30 victim surcharge and £85 costs. Pleaded guilty to using a vehicle on the A610, at Ilkeston, without a test certificate. No separate penalty. Stacy Carlin, 36, of Ray Street, Heanor. Pleaded guilty to exceeding the alcohol drink-drive limit on Ray Street, at Heanor. Must pay an £85 victim surcharge and £85 costs. Community order to last until March 25, 2019, with a one-month curfew with electronic monitoring. Disqualified from driving for 26 months. Paul Jason Bird, 50, of Ash Court, Alfreton. Pleaded guilty to speeding after driving a vehicle on the A38 Lichfield Road dual carriageway, at Burton-upon-Trent, at a speed exceeding 70mph. Fined £200 and must pay a £30 victim surcharge and £85 costs. Driving record endorsed with three points. Steven Mark Denning, 49, of Elnor Street, Heanor. Pleaded guilty under the Single Justice Procedure to driving a vehicle on the A610 at Langley Mill when he was in such a position he could not have had proper control of the vehicle. Fined £40 and must pay a £30 victim surcharge and £85 costs. Disqualified from holding or obtaining a driving licence for six months. Mohammed Ahmed, 26, of East Bank Road, Sheffield. Verdict proved under the Single Justice Procedure that at Ripley he failed to give information relating to the identification of a driver of a vehicle who was alleged to have been guilty of an offence. Fined £660 and must pay a £66 victim surcharge and £85 costs. Driving record endorsed with six points. Daryl John Atkins, 32, of Brookfield Avenue, Hucknall. 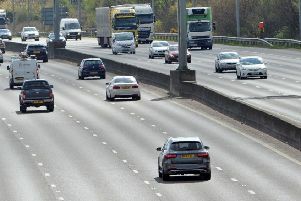 Verdict proved under the Single Justice Procedure that he drove a vehicle at a speed exceeding 50mph in a temporary speed zone between Junctions 23 and 26 of the M1 motorway at Long Eaton. Fined £220 and must pay a £30 victim surcharge and £85 costs. Driving record endorsed with three points. Jason Paul Donaldson, 44, of News Street, South Normanton. Verdict proved under the Single Justice Procedure that at Ripley he failed to give information relating to the identification of the driver of a vehicle who was alleged to have been guilty of an offence. Fined £660 and must pay a £66 victim surcharge and £85 costs. Driving record endorsed with six points. Verdict proved under the Single Justice Procedure on a second count that he failed to give information relating to the identification of the driver of a vehicle who was alleged to have been guilty of an offence. Fined £660 and must pay a £66 victim surcharge and £85 costs. Driving record endorsed with six points. Marlon Dyer, 35, of Century Street, Hanley, Stoke-on-Trent. Verdict proved under the Single Justice Procedure that he drive a vehicle at Little Eaton otherwise than in accordance with a licence. Fined £220 and must pay a £30 victim surcharge and £85 costs. Driving record endorsed with three points. Darran Eastap, 52, of Lodgewood Close, Nottingham. Pleaded guilty under the Single Justice Procedure to driving a vehicle on the M1 motorway at Tibshelf, between Junctions 28 to 35a, in a variable speed limit zone, at a speed exceeding 50mph, namely 64mph. Fined £200 and must pay a £30 victim surcharge and £85 costs. Driving record endorsed with three points. Pleaded guilty under the Single Justice Procedure to driving otherwise than in accordance with a licence on the M1 motorway, at Tibshelf. No separate penalty. Michael Lee Feakes, 44, of Godfrey Drive, Ilkeston. Pleaded guilty under the Single Justice Procedure to driving a vehicle otherwise than in accordance with a licence on Little Hallam Lane, at Ilkeston. No separate penalty. Pleaded guilty under the Single Justice Procedure to using a vehicle without insurance on Little Hallam Lane, at Ilkeston. Fined £120 and must pay a £30 victim surcharge and £85 costs. Driving record endorsed with six points. Brian Healy, 63, of Honingham Road, Ilkeston. Pleaded guilty under the Single Justice Procedure to driving a vehicle on the southbound carriageway of the M1 motorway, at Duckmanton, between Junctions 28 and 35a, in a variable speed limit zone, at a speed exceeding 60mph, namely 71mph. Fined £440 and must pay a £44 victim surcharge and £85 costs. Driving record endorsed with six points. Max Simmons Rose, 20, of Lock Lane, Long Eaton. Pleaded guilty under the Single Justice Procedure to driving a vehicle otherwise than in accordance with a licence at Long Eaton. No separate penalty. Pleaded guilty under the Single Justice Procedure to using a vehicle without insurance at Long Eaton. Fined £120 and must pay a £30 victim surcharge and £85 costs. Driving record endorsed with six points. Alan Lennox Saunders, 55, of Derby Road, Sandiacre. Verdict proved under the Single Justice Procedure that he failed to give information relating to the identification of the driver of a vehicle who was alleged to have been guilty of an offence. Fined £660 and must pay a £66 victim surcharge and £85 costs. Driving record endorsed with six points. Verdict proved under the Single Justice Procedure that he committed a further count of failing to give information relating to the identification of a driver who was alleged to have been guilty of an offence. Fined £660 and must pay a £66 victim surcharge and £85 costs. Disqualified from driving for six months. Danny Tomlin, 21, of Little Hallam Lane, Ilkeston. Verdict proved under the Single Justice Procedure that he used a vehicle without insurance. Fined £660 and must pay a £66 victim surcharge and £85 costs. Disqualified from driving for six months. Verdict proved under the Single Justice Procedure that he drove a vehicle otherwise than in accordance with a licence. No separate penalty.